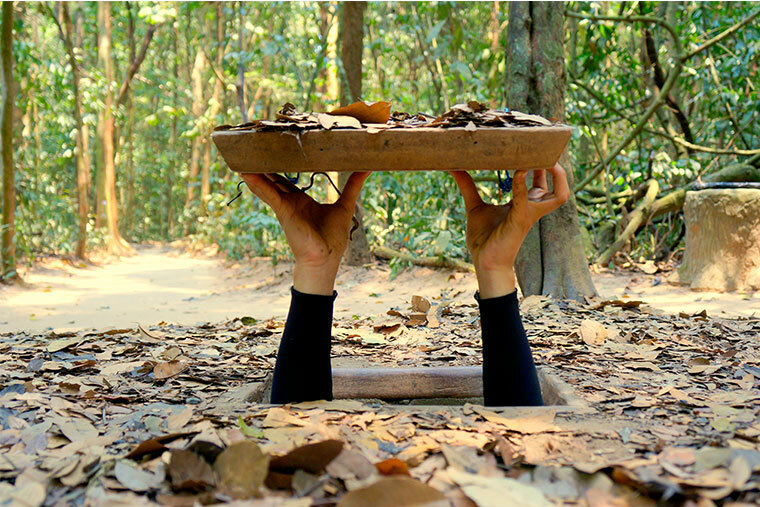 If the spirit of Vietnamese soldiers during the Vietnam War can be can be symbolized by a place, there are no better candidates than Cu Chi Tunnels Saigon. At the very first glance, there is underground evidence of fighting and bombing in Cu Chi during the war in the past. The deeper to come under the ground, the more you will know about this historic place. Nowadays, Cu Chi tour adventure is one of the most desirable tours to most of the foreign visitors coming to Vietnam. Viet Cong used this place to facilitate their hiding, living and planning. Not far from Ho Chi Minh City, the area is just around 30 km to 40 km from the city center. Speaking of its height, the underground hideout system stretches from the Southern capital of Vietnam to the border of Cambodia. The network has many floors which are deep into the system. Also, there are a lot of traps, living areas, storage facilities, weapons factories, field hospitals, command centers and kitchens in the system. Cu Chi has become a pilgrimage place for students and visitors who want to get back to the past and learn a little bit more about the Vietnam War. Riding around 1 hour from Saigon to the Northwest, you will be amazed by underground tunnels built during the Vietnam War. Saigon Riders also offers a self-ride tour if you are experienced rider.